This page is a high-level overview of our routes. For a more detailed description of each day see the detailed page for each day. I used the logs from my DeLorme inReach Explorer GPS to help with some specific times and mileages in the daily detailed descriptions of our trip. I also used texts from the inReach to recall the timing of certain events. We started at the Nine Mile trail head from the North and hiked South down the East side of Yellowstone Lake into the Thorofare. We then turned West and went across the Continental Divide. We turned Northwest to Heart Lake. On the eighth day we did a day hike to the top of Mt. Sheridan and then decided to combine day nine into day eight and get out a day early so that we could spend a day in the Grand Tetons. Each blue, red, and yellow track is a day of hiking. The small green track is the day hike to the top of Mt. Sheridan. We covered just over 90 miles total in eight days. These maps were created during our trip planning phase using AllTrails.com. The daily tracks start with a circle. The stars are way points that I marked as possible sources of water. Some turned out to be dry. However, as you will see, water was never a problem. 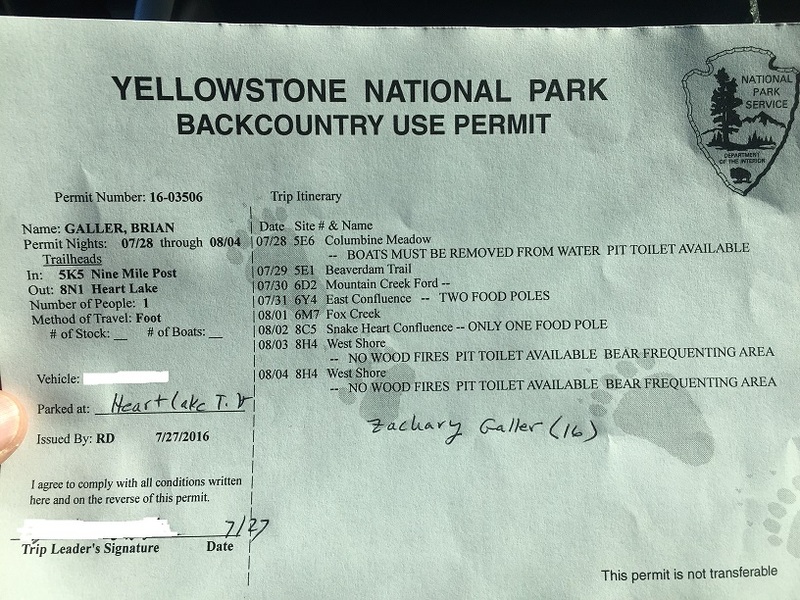 We crossed many water sources and were always within a few miles of Yellowstone Lake, Yellowstone River, Snake River, or Heart Lake. The X at the end of each track is where we camped. We started day one at the Nine Mile trailhead (5K5) and hiked about 8.61 miles down the East side of Yellowstone Lake to campsite 5E6. Day one elevation change was relatively flat at only about 620 feet total elevation gain. However, we ended the day at a lower elevation than we started at. We started day two at campsite 5E6 and hiked about 8.39 miles to campsite 5E1. Again, the elevation change was relatively flat with only a total of 440 foot gain. We started day three at campsite 5E1 and hiked about 11 miles to campsite 6D2. The elevation change was again relatively flat at only 456 foot gain. The way point about 1/3 of the way through the route was intended to mark the Cabin Creek Patrol Cabin. The cabin doesn’t exist any longer, but it took us a couple miles of searching to figure that one out. This route was supposed to be only about 8.91 miles, but with the detour searching for the patrol cabin we added another couple of miles. We started day four at campsite 6D2 and hiked about 14.46 miles to campsite 6Y4. One of our main objectives on this trip was to reach the Thorofare Ranger Cabin (way point at the bottom of this track). The Thorofare Ranger cabin is commonly known as the most remote building in the lower 48 states. It is about 32 miles to a road in any direction. Unfortunately, the ranger was not home while we were there. Again, the elevation changes on day four were relatively flat with only a 262 foot elevation gain. We started day five at campsite 6Y4 and hiked about 10.82 miles to campsite 6M7. The first flag in this route is the Continental Divide. We ate lunch there. However, we were disappointed that there was no physical marker of the Continental Divide on the trail The other flag was marking the Plateau Falls which we decided to not detour to go see. This was the first day with any significant elevation changes. We were delayed by about three hours trying to find a safe place to cross the Yellowstone River so we were pretty beat and were racing the Sun. Our elevation gain on day five was about 1,667 feet. We started day six at campsite 6M7 and hiked about 12.28 miles to campsite 8C5. The way point at the beginning of this track marks the Fox Creek Ranger Cabin. Campsite 6M7 is only about 300 yards or so from the cabin. No one was home though. Day six was mostly downhill with an elevation change of about 1,096 feet. We started day seven at campsite 8C5 and hiked about 9.11 miles to campsite 8H4 along Heart Lake. The flag in this track was supposed to mark some hot springs. However, I don’t recall seeing them. The overall elevation change of this route was about 771 feet. Most of that was a bit of a climb towards the end. On day eight we hiked to the top of Mt. Sheridan (10,315) from campsite 8H4. The total mileage up and back down was only about 6.95 miles, but was an elevation change of about 2,854 feet in just a little more than three miles. We left most of our gear in camp since this was a day hike and we were returning to camp. However, even with just the bare necessities, this was by far the hardest climb we had. There is a fire lookout tower at the top, but unlike Mt. Washburn there was not a ranger stationed there. The view was amazing. By day eight we were pretty ready to get out of the back country. Seeing the Grand Tetons from the top of Mt. Sheridan made us even more eager to get out so that we could go to the Grand Teton National Park. On our way down, we made a goal. If we could get back to camp by 2:00 PM we would pack up and combine our day nine route into day eight and get out a day early. We made it so both of the tracks below were on day eight. Total mileage on day eight was about 15.27 miles. The flag in this track marks the Rustic Geyser which we could see from Mt. Sheridan and the trail heading out. The other way point marks the Heart Lake Ranger Cabin. Again, no one was home. After climbing Mt. Sheridan in the morning and then having to climb another 1,000 plus feet out, it was pretty rough. The climb out from Heart Lake is about 600 feet up in about 1.5 miles. We were pretty glad to hit the plateau at the top.